Data Protection in the UK is changing in May 2018 and the new law gives individuals more rights over how information about them is stored and used by organisations (a Vestry or a Diocese for example). In particular, organisations have to tell individuals what they are doing with the information they are storing and using. St Mary's Data Protection matters can be found on this website under the "About Us" section. 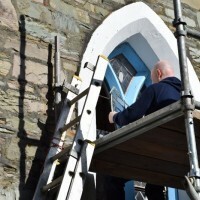 We are celebrating the start to the repairs to the 4 beautiful stained glass windows and the 2 lead light windows in St Mary's. 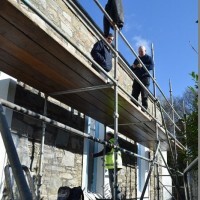 Work started on a beautiful sunny day as you can see in the photos below. 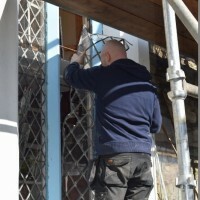 3 windows have been removed and are now being repaired. 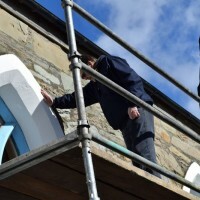 Once they have been reinstalled into the church the second phase of 3 windows will be removed and repaired. 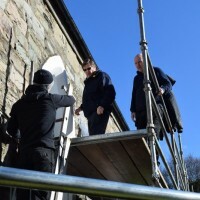 Notice is given that the Diocese of Glasgow and Galloway of the Scottish Episcopal Church is making preparation for the removal and re-interment of cremated remains from the former Holy Cross Episcopal Church, Knightswood to a new memorial garden at St. Bride’s Episcopal Church, Hyndland. The Diocese wishes to give opportunity to all interested parties to contact the Diocese in terms of its immediate succeeding plans. 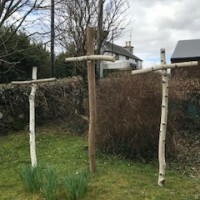 The Diocese intends to make the most appropriate and careful provision for the removal and re-interment by marking the occasion with a suitable act of thanksgiving and dedication. Families or individuals are invited to contact the Diocesan Centre, 5 St. Vincent Place, Glasgow, G1 2DH. Tel: 0141 221 5720 for further details. The Diocese welcomes the involvement of all who wish to care for their remembered loved ones with care and dignity. We celebtrated Easter in St Mary's with joy and thanks. 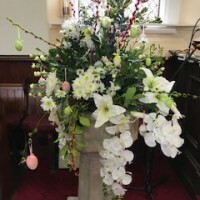 The church was beautifully - thanks to all those who decorated St Mary's with beautiful Spring flowers. There was also a lovely Easter garden. Some of you may listen to a Radio 4 programme called Last Word. In effect it offers appreciations and assessments of interesting people who have died in the week or so before the programme is broadcast. As I write, the cast includes Stephen Hawking and Ken Dodd. But it occurs to me that it’s an odd title for a programme which makes no claim that what is said is to be understood as either authoritative or the last word about anybody. Odd, simply because we all know that whoever claims to have the last word about anyone or anything is claiming to have very significant power over people or in human affairs generally. And we are all too aware of the destructive potential of such claims in the world as we experience it. But what if the last word need not be like that and what if we are about to celebrate the all-important Last Word, namely the divine exercise of power which raised Jesus from the dead? And what if this Last Word turns out be the very opposite of a destructive exercise of power, but is heard rather as a word of love, a word of life, a word of vindication, a word of triumph over the worst that we humans can perpetrate, because it is uttered by no human claimant to power? And if that is true, and it is our faith that it is true, then here is a Last Word which constantly constitutes our hope and our ground for trying to live what we might call Christ-shaped lives, lives that may seem to meet with little favour in a hard and unforgiving world, but lives that bear the glory of resurrection now and at the end. I suggest that at its best the liturgy of Easter celebrates this hope and strengthens us in living it out. I wish you all a blessed Easter. We remembered the work of ladies in our community on Mothers Day. 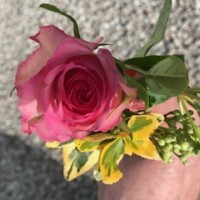 All the lassies were given flowers to take home, and our thanks go the Beth, Helen and Tinny for making these beautiful flowers. Thank you all for attending this service yesterday in St. Mary’s, despite the inclement weather. 24 people were there, and £78.65 was raised for the designated charity, “the Fellowship of the Least Coin”. This is an international women’s charity. An especial thank you to all who participated and to Susan Smyth for playing the organ and Barbara McFarlane for helping me organise the event and providing the very welcome tea afterwards. 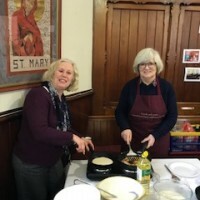 What fun was had throwing and eating delicious pancakes ..!! 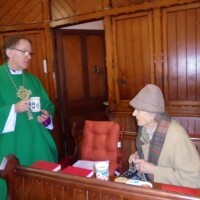 Thanks to Liz Cutler who hosted the event in church and through whose hard efforts monies were raised for church funds. Bishop Gregor can to visit on February 4th where he took our service and was the preacher. 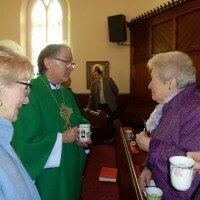 His company was then enjoyed over a coffee and biscuits in St Mary’s. 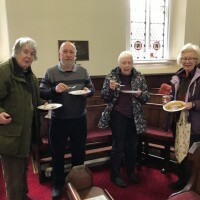 Later in the day there was a joint bring and share lunch with Greyfriars in Kirkcudbright. The 2018 Bishops Lent appeal is for Motor Neurone Disease Scotland, in memory of our late Diocesan Secretary, Chris Zochowski who died from Motor Neurone Disease earlier this year. Thank you to everyone who attended the Christmas Eve carol service at St Mary’s, and made it into such a fun and very well attended event. Because of your generosity a wonderful total of £200.00 was raised for Mary’s Meals, and the cheque has been sent to the charity. Thank you for your support for Mary’s Meals.